There are some flavor combinations I never tire of regardless of what time of the year it is. The classic flavors of basil and tomato with a sprinkle of minced red onion, squirt of lemon, and drizzle of fruity extra virgin olive oil will always entice me. Equally delicious are chopped fresh tomatos, green onions, cilantro, and jalapenos with lime juice — a combination so perfect, I can easily skip the tortilla chips and head right for a spoon to enjoy the salty-tart-spicy flavor that would never be the same without cilantro. I think I love cilantro even more than basil. But another combination has come close to pushing both of the others aside as being tops in my mind — or my mouth: roasted peppers, capers, and briny olives. Ironically, the flavors in this combination would work quite well with many of the others I’ve mentioned, but I enjoy them in a mix like this one — assertively delicious with the unexpected addition of anchovies. Anchovies? Those little fish in the can with the curly lid that when I’m ordering a pizza to go topped with “the works” I always politely decline? The little salty things whose absence would leave a Caesar’s salad an unappetizing plate of flavorless lettuce, and pasta puttanesca without anything to be sassy about beyond a sprinkle of dried red pepper flakes. Do any of us ever really say we like anchovies? Probably not, but the key to learning to stop avoiding them is to see them as an ingredient to be mixed with others instead of sitting on top of a pizza. If the anchovies were mixed into the tomato sauce instead, it would intensify the flavor leaving us to wonder what made it so good. Think about it. How many other ingredients which enhance one another when mixed together are basically unpleasant when eaten alone? Capers. I’ve tasted them just to see, and they’re quite bitter. Or in most recipes which call for capers, the directions will advise rinsing them first. For years, I did just that, and to make sure I understood why, I tasted the brine. Not pleasant. But when it’s mixed into many other ingredients, it’s quite fabulous. Soy sauce, fish sauce, vinegar — all are less than pleasant when tasted alone. Freshly roasted peppers, on the other hand, are perfect alone sprinkled lightly with salt, but they’re truly delicious in this mix. It’s perfect tossed with pasta for a salad when you don’t feel like cooking, or spooned over grilled meat or fish. It’s helps make an omelet interesting and is especially excellent spread over a piece of crusty bread slathered with goat cheese. It’s the best party food even if you’re the only one at the party, because then you don’t have to share. Be brave. Don’t forget the anchovies. 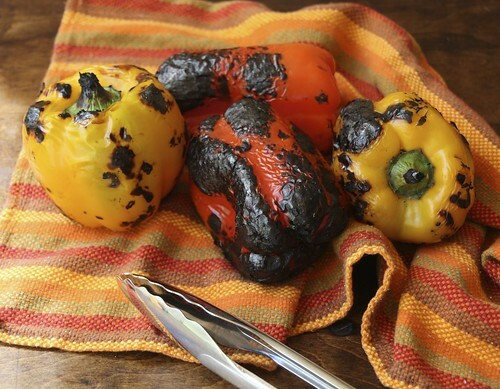 Roast the peppers whole on the stove top over an open flame or cut in half and placed on a baking sheet under the broiler until skin is well blackened. Wrap in a clean, soft cloth about 15 minutes, then remove the peelings, the stem, and the seeds. Do not rinse the peppers. 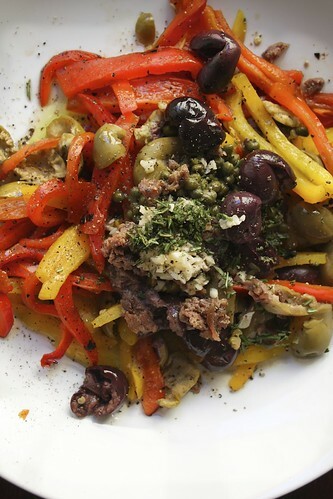 Slice the peppers into thin strips and add them to a bowl with all ingredients except the goat cheese and bread. Slice the bread into rounds, or into sandwich sized lengths, drizzle very lightly with olive oil and rub with a clove of garlic. Broil or grill until golden. To serve, spread some goat cheese on the toast, and spoon over some of the roasted pepper salad. This recipe was adapted from one of Mario Batali’s published in Food & Wine. Credit to him for getting me to try the anchovies like this. So good. I know olives can be difficult to find at times. When I look at the kind of olives stocked in my grocery store, it’s a bit ridiculous. There are essentially two choices: canned black and “Spanish.” Lots and lots of labels, can sizes, sliced or unsliced…really? I can find kalamatas as well, but they never have the shelf space that the typical American olives do. Food times have changed — why hasn’t the shelf space in markets? Do people still eat that many plain black olives? Thankfully, there is an olive bar, so I’m able to try a different variety from time to time. When I really want to sample different varieties, Whole Foods is the best source here. “Give Anchovies Another Chance” is a great article about anchovies. Take a look. 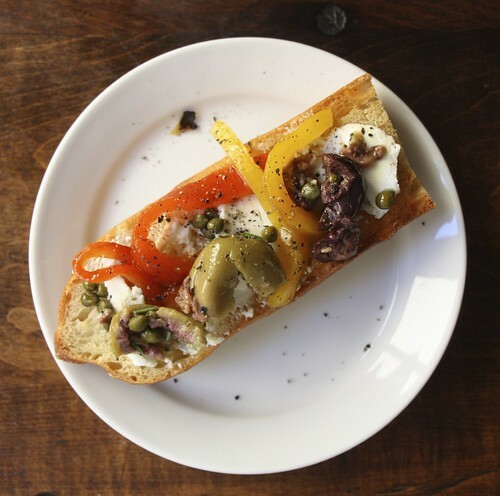 On the bruschetta: We think it’s easier to mince some fresh garlic and add it to a couple of glugs of extra virgin olive oil and let it sit a bit before brushing it on the bread. Rubbing that piece of garlic over the surface of the bread is maddening, but maybe I’m just not gifted in that particular skill. 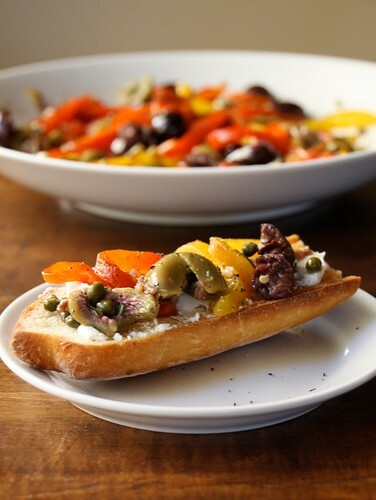 More on the bruschetta: Unless you enjoy eating soggy food, plate the toast, goat cheese, and a bowl of the roasted pepper and olive mix so that guests can make their own bruschetta. Make this ahead — the flavors intensify and are even better after they’ve had some time to mix. Cover and leave at room temperature instead of putting it in the fridge.